Cortland, NY. The New York Grazing Coalition, Organic Valley Cooperative, and Cornell Cooperative Extension are hosting three free on-farm healthy soils workshops for dairy operators who graze their cows. The workshops in Groton, Lisbon and Little Falls, NY, will feature hand-on learning opportunities with the National Grazinglands Coalition Soil Health Trailer and soil health presenters. The National Grazinglands Coalition Soil Health Trailer is equipped to measure and demonstrate vital physical, chemical, and biological components of soil health. Workshop participants will use penetrometers to measure soil compaction, and see a demonstration of the Active Carbon test that measures how much food the soil contains for the biological organisms that support soil health. NY Organic Dairy Initiative Coordinator Fay Benson will compare soil management plots under a rainfall simulator to measure soil aggregate stability. Livestock concentration, soil compaction and erosion, living plant cover, dead plant residue on the surface, forage mass and height and soil organic matter are some workable aspects of grazing land management. At each workshop, Organic Valley Cooperative Soil Agronomist Mark Kopecky will present farm management factors that contribute to overall soil health and consequently the growth and productivity of grazing lands. He will cover the soil traits that affect rainwater runoff and infiltration. The workshops also include a short presentation on USDA Risk Management Agency policies to address the types of farm risks that are more difficult to manage. August 26: Dan Casler’s Organic Dairy, 909 Paradise Road, Little Falls NY. 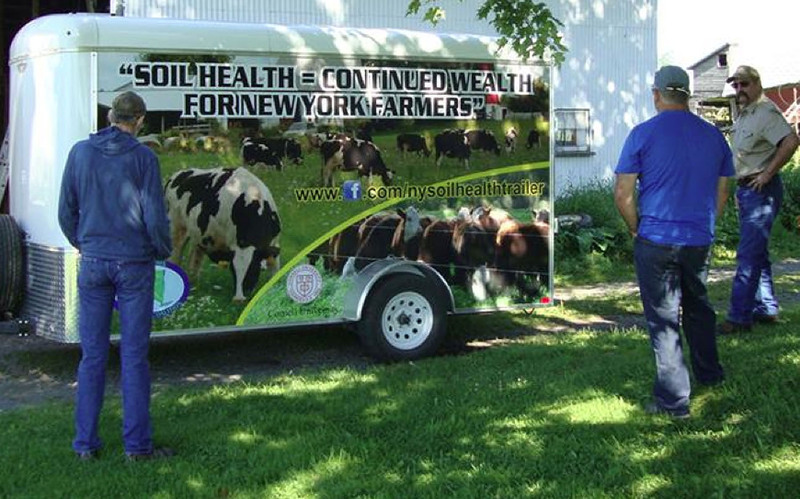 The National Grazinglands Coalition Soil Health Trailer is available to New York through a five-state Conservation Innovation Grant funded by the USDA Natural Resources Conservation Service.